Happy Bloggers Challenge Friday, I'm so glad you stopped by today! Thanks to everyone who played along with lasts weeks Embossing Challenge, it was wonderful to see so many different embossed projects! This weeks challenge is a color challenge - we're using the colors Brown, Green and Purple, the shades of these color are open for your interpretation. I used Sage, Chocolate and Amethyst as my colors. I found some fab flourish paper in my stash from The Paper Loft that had subtle shades of Green and Brown, that worked perfectly with the challenge colors. I distressed the edges, on all panels, sponging with Ranger Walnut Stain Distress Ink. 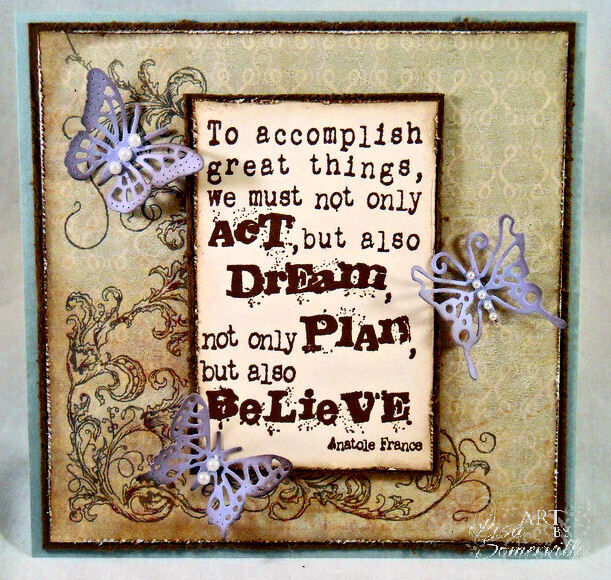 The sentiment (Accomplish Great Things IN0225-F) is from Verses, stamped in Chocolate on Vanilla card stock, I added the Torn Frames Technique to the Chocolate Panel. 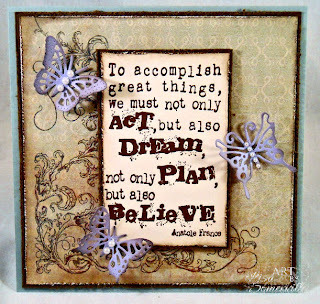 The beautiful Butterflies are from Cheery Lynn Designs, cut from Amethyst card stock, and sponged with Walnut Stain ink. 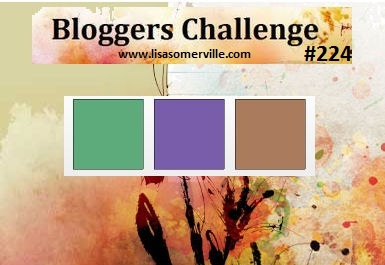 If you'd like to play along with this weeks Bloggers Challenge, please link back to this post on your blog and mention you created your card for the Bloggers Challenge Color Challenge. Please add your link using the Link Tool below. Just a note on the link tool, your link should be a direct link to your Bloggers Challenge Post, use your name as the Title. Please do not link to cards that were created prior to the challenge date. Entries not linking properly, or backlinked will be removed. Hey Lisa- your card is beautiful! I struggled a bit with this challenge but worked it out in the end. Love the soft muted colors you chose! Your butterflies are just the right touch! Have a great weekend! You always make this look so easy! Great card, luv the saying. Beautiful card and the colors are amazing together! Love that flourish and too bad it is not a stamp! Happy Friday! Love this quote!!! Fabulous making it the focal point with those cute butterflies fluttering around. Awesome card. Love the sentiment. The butterflies are beautiful. This is beautiful! The butterflies are a lovely accent for the quote. Truly beautiful, Lisa. Love the word message. Great card. What a lovely card. The embossed butterflies are so elegant and dainty. You did a great job using muted tones of the color scheme. I'm with Chrissy in that I initially struggled with the color combo but it all worked out in the end. Love the subtle, soft way you used the colors! Those little butterflies are a wonderful accent for the focal text! Beautiful and elegant. Love the flourish behind the main image and the butterflies. Gorgeous card! Love the butterflies and the text is beautiful! Thanks for joining us on our first challenge at It's all about the Vintage. Hope to see you soon again!